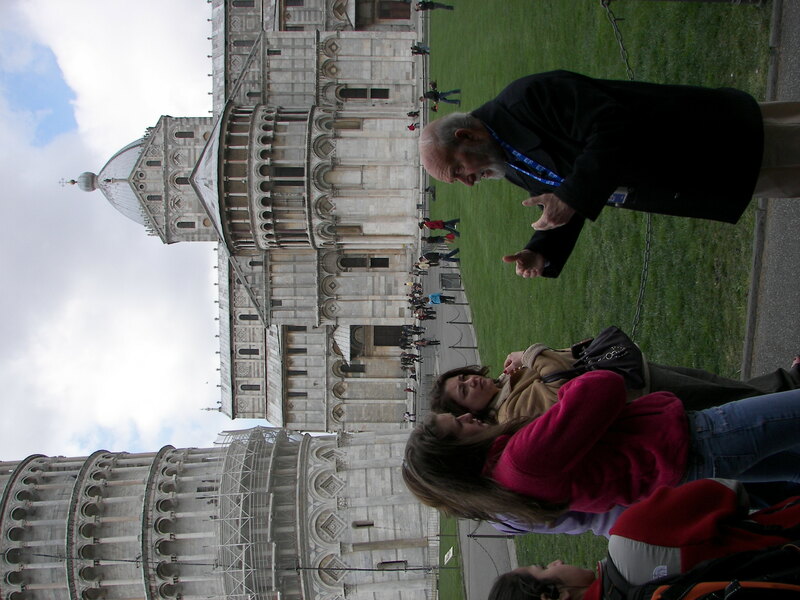 Minooka kids learn about the history of Pisa’s leaning tower. Q – Who is TAP Adventures? A – We’re a group of teachers who really believe that getting your hands dirty and experiencing the world is the best way to learn about it. We used to be called Minooka TAP, but since our program has grown, we changed our name to reflect that kids from all over the Chicago suburbs participate in our adventures. No matter our name, we think that seeing where the history happened, standing in front of ancient monuments and prized works of art, eating weird foods, and immersing yourself in a foreign culture is the best way to learn. We’ve dedicated our time to creating annual trips overseas so that local students can experience the world in a new and unique way. Q- Okay, good answer, but stop being mysterious, who do you think you are, Batman? A- No, we’re not Batman, although if the school dress codes allowed us to, we may pay a visit to his tailor. Seriously, TAP is made up of a group of teachers from the Minooka/Plainfield/Oswego, Illinois area. We all started out in Minooka (hence the original name of the group), but we’ve spread out quite a bit to give this opportunity to more kids. We’re led by Mike Curtis (a high school English teacher in Oswego), Jackie Harig (a junior high history teacher in Minooka), Kristopher Doerr (a middle school social studies teacher in Minooka), Angelica Lara (a school social worker in Homer), Cathy Tadey (a middle school band director in Minooka), and Jim Keeton (a speech teacher in Joliet). In addition to those teachers, other teachers and adults participate in trip preparation and travel with us when the size of our traveling party necessitates additional chaperones. Q- So what kind of trip are you talking about? Exploring Berlin on the first night ever for TAP. historical and cultural significance. We do our best to prepare students for these travels, learning about the culture, language, literature, history, and even the food of the countries we visit. Each day is long and full of educational experiences that the kids will remember for their entire lives. In our tours of Germany, Greece, Italy, Ireland, Portugal/Spain, Japan, England, Poland/Austria, and South Africa (with short excursions into Turkey, Vatican City, Northern Ireland, Gibraltar, Morocco, Wales, Slovakia, and the Czech Republic) – we’ve seen priceless works of art, explored underground dungeons in ancient castles, worked alongside important archaeologists, wandered the remains of ancient cities, climbed to the top of volcanoes, cruised around the Mediterranean Sea, ridden camels, socialized with apes, watched sumo wrestlers practice, danced on stage with cultural performers, seen theatrical performances, walked with elephants, and held baby lions. Future trips are in the planning stages and destinations like Scandinavia, Costa Rica, Thailand, Australia, Peru, China, Russia, New Zealand, Brazil, Croatia, Scotland. Belize, Cuba, and Switzerland have been discussed by the group leaders. Q- Who goes on these trips? A- For the first four years of the trips we limited it to 8th grade students at Minooka Junior High. Since we got started, we have talked about expanding our program to include students from other area schools, and we’re doing just that. 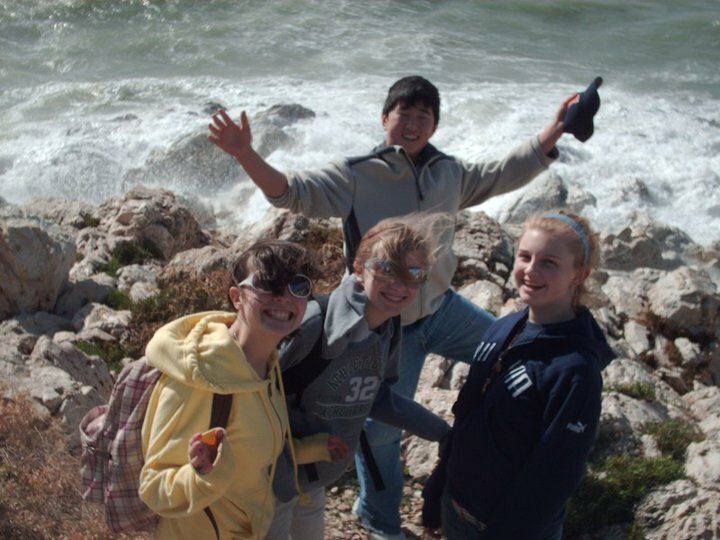 Starting in 2012, we began to allow former student travelers to take another trip with us. And beginning in 2014, we had a few students from outside of Minooka. In 2015 our program grew to include kids from eleven different schools around the area, so we changed the name to TAP Adventures. Any 7th-9th grade student from the area may apply to join our program. Students are selected in the fall of one school year and travel the summer after the next school year, giving them more than a year and a half to save money and prepare for their trip. To be selected into the group, students must complete a TAPplication – which consists of a few short essays – and have letters of recommendation from teachers and other adults submitted on their behalf. The application forms are right here on our website. 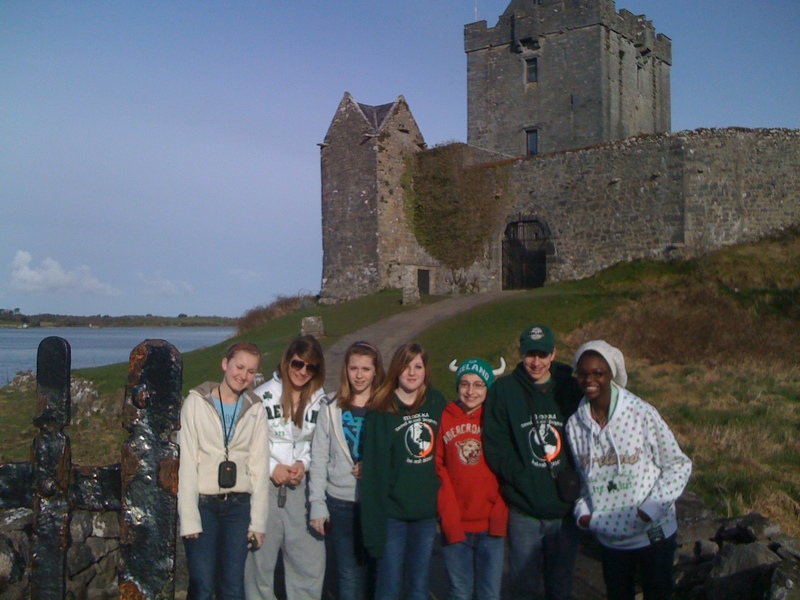 In 2010 we visited Castle Dunguaire near Galway, Ireland. Q- If my kid goes, can I go to? A- Sure. The more the merrier. We’ve seen so many fathers and sons, mothers and daughters (and the other way around), and even grandparents and grandkids bond in amazing ways during our travels that we’d love to keep seeing parents, grandparents, and other family members and family friends travel with our students. That said, we do give priority to student applicants. If a particular trip is so popular that the number of students and teachers fills the bus, we’ll have to leave moms and dads at home – sorry, grown ups, the kids do come first. See the rules that go along with this further down the FAQ list. Q – Can a kid go on more than one trip? A – Why not? We actually started up a program that launched with our 2012 trip to Japan. This program is called TAP Mentors. These mentors are high school students who have traveled with TAP before and know the ropes of foreign travel. The mentors assist the teachers in the educational aspects of the trip and in turn get another opportunity to travel (and potentially earn some college credit along the way). Of course, they have to have been stellar travelers their first time around to be selected for another trip. Q – College credit? The kids can really get college credit just for going on a really cool trip? 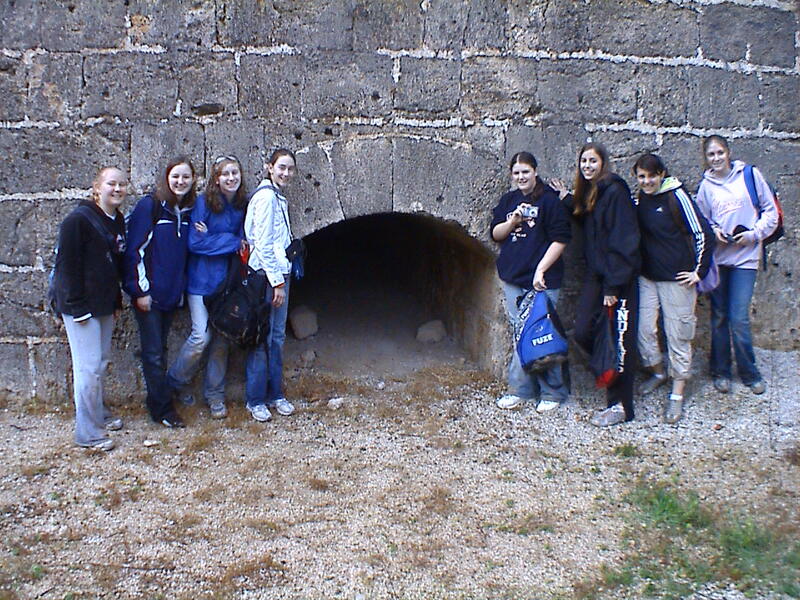 TAP girls explored Rhodes Castle, eventually finding a secret passage from the dungeon out into the castle moat. A – Yup, they can. It costs a few bucks to enroll them in the college course, but the TAP teachers will help them complete most of the work before or during the trip. Q – Who do I contact if I have a question that’s not addressed in this unbelievably awesome list of questions? How do I contact them? A – If you have a question, concern, or suggestion please feel free to email us (MinookaTAP2@gmail.com) or chat with us on our Facebook page. 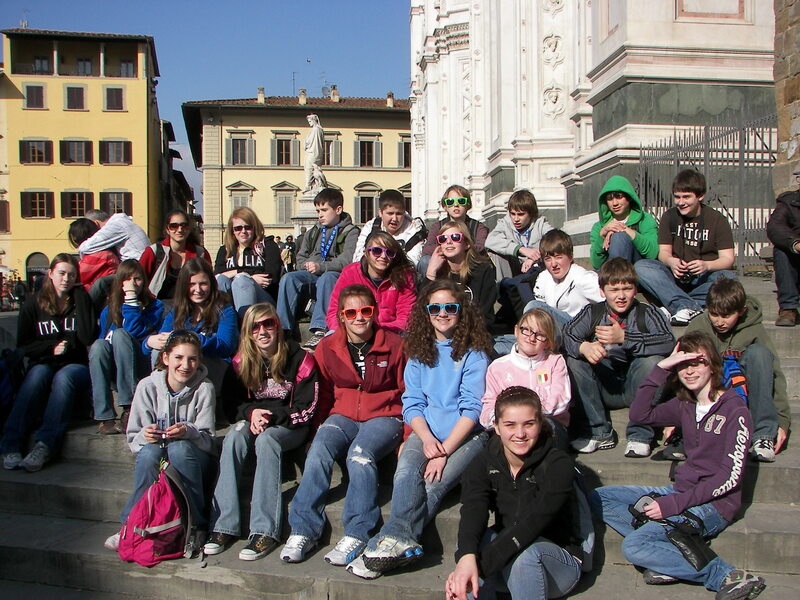 The gang takes a break in Florence, Italy. Q – Where are we going? A – In June 2016 we’ll head off to to Northern Europe, visiting all three Benelux countries (Belgium, the Netherlands, and Luxembourg) before heading to Paris and the beaches of Normandy, France. Last year we went to South Africa for 11 days of learning about African history, culture, art, and music – including several days on safari tours. Future tours are announced each fall, about 18 months before travel. Q- Do you guys at TAP Adventures do all the planning and travel arrangements and all those really complicated things? A- No. We work with a company called EF Tours. For 50 years, EF has been arranging and planning student travel. For more than a year before we travel, we make plans with EF, working closely to plan the perfect trips for our students. Once we arrive at our destination an EF tour guide, who is native to that particular country, is by our side until we get back on the plane to go home. EF arranges our transportation, hotels, tours, entrance to many attractions and events, and even most of our meals. EF also has the power to negotiate some of the lowest prices for airfare and hotels you could imagine. They also plan trips with students in mind, picking destinations, food, and activities that students will love. It was close quarters in the caves beneath Blarney Castle in Ireland, but the girls managed to line up for a picture. Q – What’s on the itinerary? A – Rather than typing in the whole long list of wonderful places we’ll be visiting, we’ll just direct you to the EF Website, where they give detailed descriptions of each of the stops on our tour. Q – How much does this thing cost? A – That depends on where we’re going. The cheapest trip we’ve taken was Ireland a few years ago. That was about $3300 per student. South Africa is our most expensive at about $4700. We always try to keep it between those numbers, and we really strive for the lower end of that. It varies. Q – Why did you just say that the price may vary? A – It all depends on where we go. England is a lot closer to O’Hare airport than Tokyo is, so the Japan trip was a bit pricier. The price is also reliant on the activities we select. It is also dependent upon when you enroll. The faster we get our group enrolled, the lower the costs for everyone. EF offers individual discounts and group incentives for people who enroll earlier. A few Minooka kids wanted to take a dip in the Mediterranean Sea when we stopped at the island of Mykonos during our Greek adventure. Q – What are the dates of the trip? A – Our 2011 trip to Spain left on June 13. We returned 12 days later. Our Japan trip in 2012 ran from June 14-25. The England group left on June 6th, 2013. We aim for that time frame every year. The trips are always around 11-13 days long. To keep costs low, we have to be flexible on our dates, so we don’t ever have a firm departure date until about 90 days before travel. Q – What if I decide to cancel? A – This is really between you and EF. We organize the trip on the student end, but EF is where the money goes. Here are the basics though. The first $95 you pay are non-refundable. Up to 116 days before we leave, you would pay a $150 cancellation fee if you decide to drop out. After that point, the money is non-refundable, since EF has already arranged plane tickets, hotel reservations, and meals for you. There is a trip insurance policy that you can purchase through EF that you may want to look into, but that’s an EF thing that you’d have to ask them about. Q – What are the hotels like? A – European hotels are generally quite small, so don’t expect space to have a dance competition in your room, although in Ireland our students did hold an “Irish Idol” talent show in one of the rooms. The rooms have what you need – a bed and a bathroom with a shower. Most of the hotels have had public spaces where we can hang out and talk, but we spend so little time in the hotel and our days are so packed with adventure that you’ll only really care about the bed and the shower. Hotel rooms in Japan were really small, but they had beds, toilets, and showers, so we didn’t complain. The rooms in South Africa were unbelievably nice in the big cities, but during our time on Safari we stayed in these really cool huts – there were warthogs and zebras grazing just outside our doors. The only things we really care about in a hotel are safety, cleanliness, a few beds, and a bathroom, and we’re always guaranteed those things – even in those huts. Q – No really, what are the hotels like? been quite nice, clean, safe, comfortable, and better than the Motel 6 (apologies to one of our favorite travelers who works for the 6). If you still have questions, a few months before we leave, EF will give us a list of the hotels they’ve booked for us. Once we have those, we can all look at the hotel websites and see for ourselves what they’re like. Since space is at a premium in Europe, they’ll take just about any existing building and use it for something else, so we’ve stayed in a hotel or two that used to be castles, city walls, or military installments – those are actually the best experiences. Hotels in Japan, while small, were really cool, very nice, and clean. Q – Will I have a roommate? A – Yes. This is a student trip, and it’s done with minimal expense, so you will be sharing your room. Boy students will room with other boy students. Girls will stay with girls. Depending on the hotel, each room will house between 2 and 4 kids. You may not have the same roommates every night, because we like helping you make new friends during your travels. Q – Okay, I’m not a student, but I’m going on the trip with my son/daughter. Do I have a roommate? A – That’s up to you. Adult rooms are done in pairs. If you really don’t want to hear another adult snore all night (or are trying to hide your own snoring issues) you can opt to have a single room. You have to select that option when you register, and there is an upgrade fee to do that. Sometimes our hotels are a little unusual. 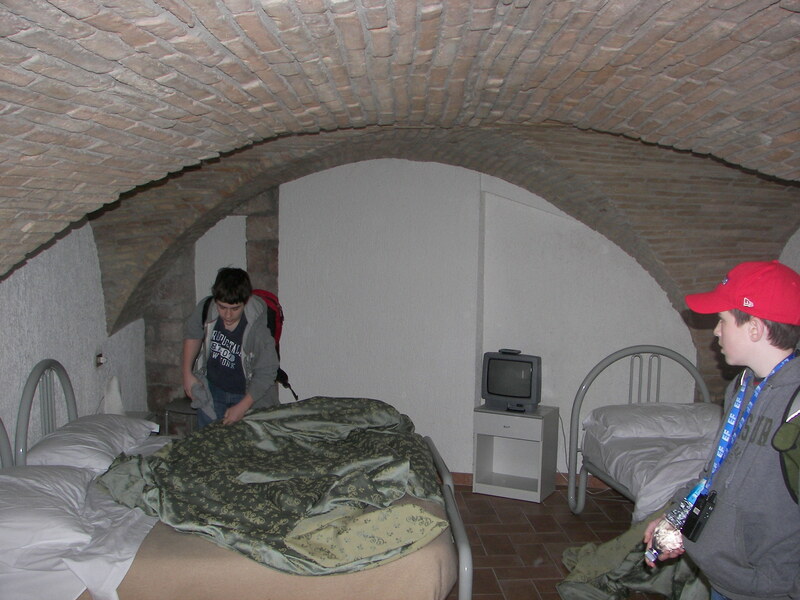 This one, in Assisi, Italy, was built inside the medieval city walls. Q – Are kids going to be roaming hotel halls all night long? A – First, we only accept good kids, so we have don’t expect this to be an issue. Second, no. Student rooms are usually sandwiched in between adult rooms. Adult travelers and teachers are always on guard for kids who might feel the need to leave their room. Students will be given some freedom, but there will be a designated “in your room” time each night (that time depends on the activities of that day and the next morning) and a “lights out” time. At “lights out” teachers will check on each room to make sure the right people are in there. They will ensure that the door is locked, and they will pull an old coach’s trick of taping the doors shut. Tape on the outside of the door can be broken, but someone inside the room can not possibly replace it. Any escapees will be found out. Again, this has never been an issue in the past, because we picked all good kids. Quite honestly, if you’re concerned that your kid is going to escape his or her hotel room and wander the streets of a foreign city, then this isn’t the right group for them. A – See the discussion on prices above. The final price may vary a little bit up or down from there, dependent on a few factors. (Why? Check the Trip Particulars section above) Most of the trips we design are close to that in cost. You can check prices on EF’s website, but the initial costs they show you are before airfare is added, so be sure to explore a little further to get an accurate idea on what things run. Q – Alright, I’m forking over all this dough, what is included? A – Airfare, hotels, breakfast and dinner each day, a tour guide, the bus that takes us all over the place, and admission to most sights. 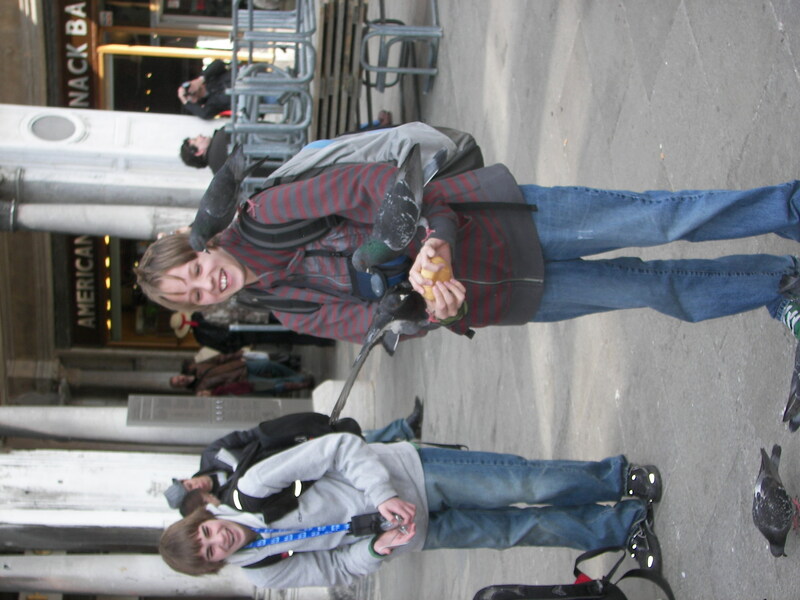 In St. Mark’s Square in Venice, one Minooka student shared his lunch. Q – That’s a lot of stuff that’s included. So what do I still have to pay for? Q – Did you really spell miscellaneous right without using spell check? A – Yes, and that’s three times now. We rock. Q – What’s the deal with the fund raising? A – There are costs here and there that come up while we’re gone, so we like to have a little reserve cash to cover those things. A – Tips are the biggest expense we try to cover with fundraising money. The tour guides and bus drivers that travel with us work for tips. Instead of passing that cost off to the students, we use fund raising money to pay for the tips. Rule of thumb is to tip our guides and drivers about $11 a day per traveler in our group. We try very hard to raise enough money to cover this for all of the student travelers, but if we are unable to, students or their parents will be responsible for covering these costs prior to departure. We do not cover tips for adult travelers, so we ask that each grown up be nice and tip these hard working folks. We’re happy to tip on your behalf so you can relax and enjoy the trip, just give TAP teachers $150 in cash at the beginning of the tour and we’ll handle all tipping for you. 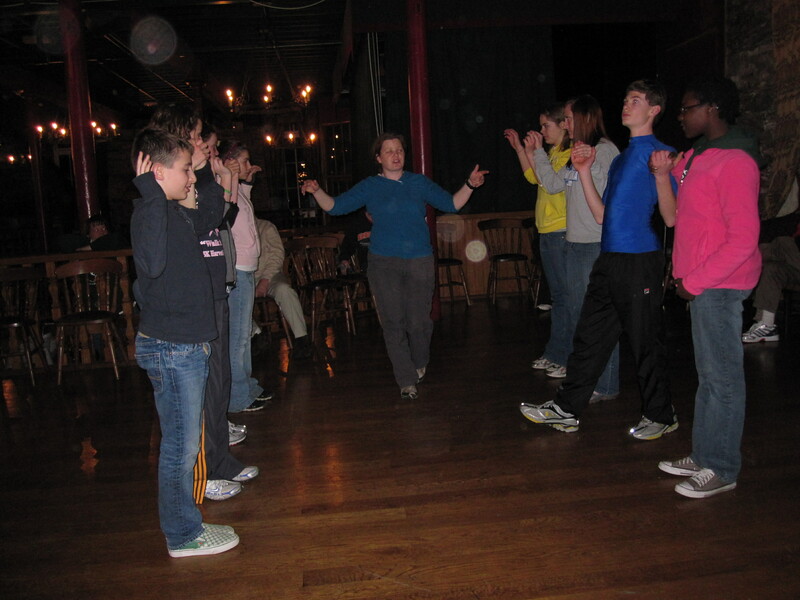 Lorna, our tour guide, taught us some Irish dancing basics one night. A – On each of our trips in the past, the days have been scheduled pretty full, but every once in a while the guide will present us with an opportunity to visit someplace that wasn’t included on the initial itinerary – in Ireland we had several of these opportunities: crossing a really cool rope bridge, attending and Irish Music concert, watching a sheepdog demonstration, and taking a tour of Newgrange (an ancient passage tomb that is older than the Egyptian Pyramids) – In Spain we were offered an opportunity to climb to the top of the cathedral in Toledo, see a Flamenco performance, and trying some Spanish tapas. In Japan we got to go to a Japanese baseball game, seeing the Fukuoka SoftBank Hawks play. In the Czech Republic we got to enjoy an incredibly unique black light theatre show, and in Germany we took a bicycle tour of Munich. Each of these activities were expensive, but the group was able to pay 100% of the students’ costs from our fund raising money. If we raise enough money before we go, we are able to pay for all the students to take advantage of these extra opportunities with no expense to the kids. Again, if fund raising (which is done by the students) does not cover these costs, they will fall on the kids or we will have to make a decision to skip one of these fun opportunities (we don’t want to take that option). Q – Do any of the funds that are raised help me pay for my trip? A – Sorry. You’re on your own there, but we always recommend that these kids earn at least of portion of the trip money themselves. We’ve had numerous 13 and 14 year olds pay for their entire trips with money raised through babysitting, petsitting, house sitting, plant sitting, lawn mowing, leaf raking, and snow shoveling. As teachers who’ve been doing this for a while, we really feel the kids that get the most out of their experiences are the ones that understand the value of a dollar. Q – What if I’m an adult traveler, do I get to share in this pot o’ raised funds? 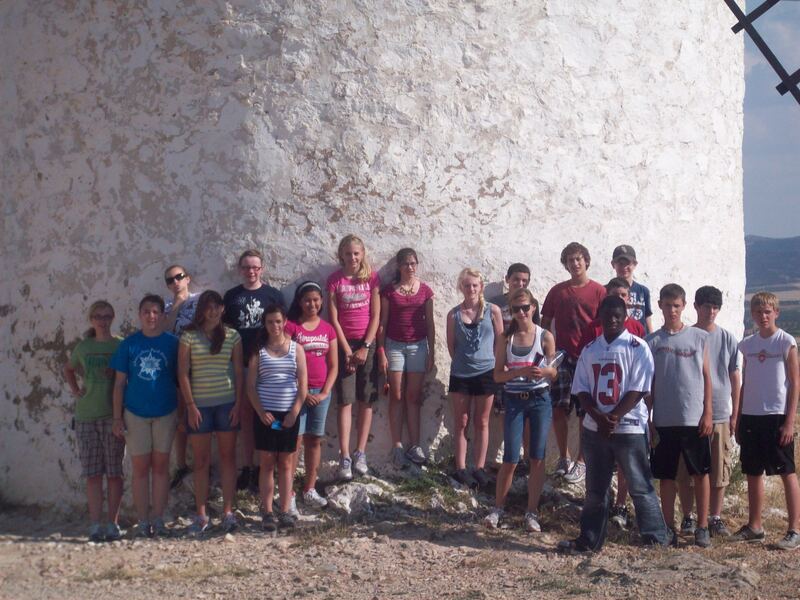 TAP students in La Mancha, Spain, standing next to the windmills that Don Quixote mistook for giants. A – No. You have a job. Seriously, the funds are raised to offset student costs. Adult travelers will be asked to chip into the tip pot before departure. Extra excursions that pop up along the way will also be your responsibility. Sometimes there will be warning weeks in advance about these opportunities, other times they will be completely spur of the moment decisions – we will communicate what we do know with the adult travelers to help them budget their money. Q – What if there’s fund raising money left at the end of the trip, do we get a pile of cash to share? A – Well, that’d be a really nice problem to have. Let’s raise enough funds that we need to have that discussion. In the past, the small chunks of change we had left at the end of the trips were used to buy the kids lunches here and there or used for snacks at the airport on the way home. It does all end up going to the kids. Q – How is the fund raising money divided? A – Students are expected to help. The trip is better for all of us if you’re prepared, so you are required to attend meetings outside of school (meetings are once a month). At those meetings we’ll help prepare you for the trip with lessons on history, culture, science, and literature. You’re also expected to participate in our fund raisers. Students who participate in the fundraisers and attend the meetings will benefit from more of the money than students who do not. We ask that students participate in enough fundraisers that they make $400 for the group (which is about the amount TAP spends on each student for educational materials, tips, excursions, and other things). If every student reaches this goal, TAP will have more than enough money for the trip. Q – I’m a parent of a traveler, can I get involved in the fund raising too? A – Absolutely. We’d love the help. In fact, we need the help. If we’re going to raise enough money, it will take all of us to do it. Once we’ve selected our student travelers for the next trip, we’ll meet with everyone’s parents. At that point we’ll ask for volunteers to form the fund raising committee. Some parents help get corporate sponsorships, some sell things with us, others use their business to help raise funds. Whatever you can do to help helps. Q – What type of fund raising do you do? A – Well, we’ve been pretty successful with our HoopsMania fundraiser, so we’ll continue with that. In the past we’ve held school dances, sold cheesecakes or pies or candy for the holidays, had dodge ball tournaments at school, ran a skating party, and hosted a bowling night. These ones have all been pretty successful, but we’re certainly willing to listen to good ideas (mediocre ideas are also accepted, but save bad ideas for the band’s fundraisers). 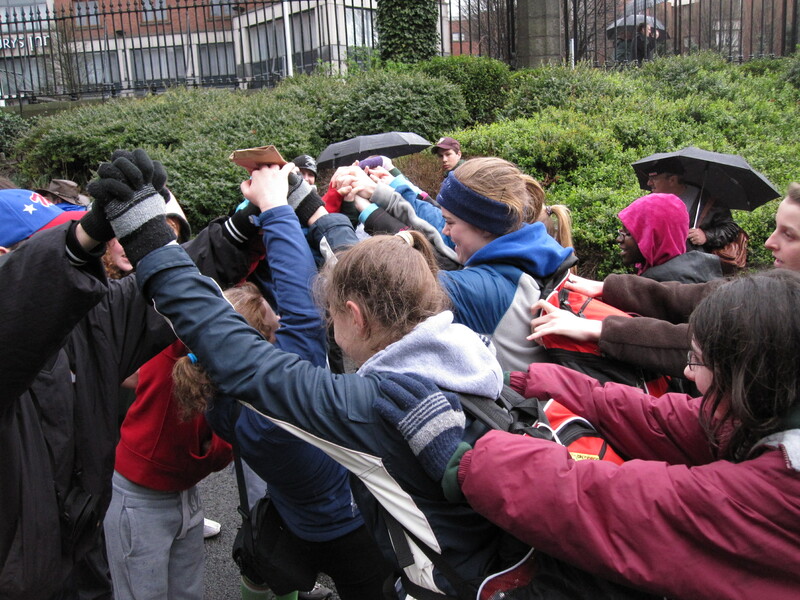 We’ll continue to run a handful of fundraisers, but we expect the majority of the work to be done by the students. Q – How and who do I pay? A – You need to register yourself, your student, or whoever is going on the trip on the EF website. Once you are selected to go on the trip, we will provide you with a trip registration number to register yourself online or over the telephone. Once you do that, payment options will be given to you. Q – Can I just write a check to Mike, Jackie, Angelica, Kris, Cathy, or Jim? A – Yes you can. Feel free. We also accept cash, traveler’s checks, and money orders. HOWEVER, any money you give us won’t help pay for your trip. Payments for the trip are between you and EF. We teachers have nothing to do with the money (other than fund raising dough and moneys collected from adult travelers to put in the tip pool). Q – Can I come with my kid? A – You are welcome to participate in the trip. The more the merrier. In the past we’ve had moms, dads, moms and dads, older sisters, a cousin, a great aunt, a handful of grandparents, and a family friend tag along. Of course, they have to pay their own way, but we like big groups. However, space is limited, so let’s be fair and not make it an extended family reunion. Again, as stated above, kids get the priority. If we have 30 open spots and 30 great kids and 20 parents want to go, those 30 spots will go to kids first. Adults (besides the teachers) get the leftover spots. Q – If I come with my kid/grandkid/nephew/a random stranger, will I be a chaperone in charge of students? A – Nope. You’re free of responsibility. Of course, if you want the student related to you to hang out with you, you may take them, even if they don’t want to. If you want some alone time and want us to keep track of your rugrat, we will. All we ask is that you be a responsible member of the group – be places on time, model good behavior, and remember that we (the teachers) are the sheriffs in this town (however, we’d really like you to be our deputies and nip bad behavior in the bud or at least bring problems to our attention). Q – Who’s the boss? A – Very simply, the teachers are in charge. Your input is welcome, but decisions and discipline are ours to handle. This is our job, so we’ll do it. You can enjoy your trip, bond with your kid, and soak in the amazing sights. Of course, in a group as large as ours, we will need some help. We could pull out that sheriff and deputy analogy that we used above, but I think you all get it. Q – Can I take my kid away from the group for a while? A – Yes you may, but when you leave the group, you are responsible for getting yourself back to the group. Q – Can I take my kid’s friends with us away from the group for a while? Q – What if I don’t know any of the other adults? A – Then this is a great opportunity for you to make some new friends. Our bowling night fund raiser is a great place to get to know some of your fellow travelers, as that is an adult only event. We also do a group outing (as a fundraiser) to a Sox game each year, so you could meet people there. Additionally, we sometimes have a get together at some sort of restaurant or bar for all the grown folks to hang out and meet a few weeks before travel. Last year’s meeting was a lot of fun and several people made some great friends. A group of our adult travelers (parents and grandparents) from Italy in 2009 have become so close that they still meet up once a month and many of them intend to travel with us again this year and next. Q – This is an educational tour, right? A – Absolutely. We pride ourselves on having our students better prepared academically than any other group out there. Most of the student tour groups we run into are juniors and seniors, and tour guides, parents, and other teachers we meet on tour have repeatedly told us that our group seems so much better prepared than theirs. That makes us happy. Q – How do you accomplish that? A – It’s dedicated teachers. Of course any teacher that is willing to take a student group overseas has a certain level of dedication, but here at TAP it’s more than that. TAP is teachers, not tourists. We’re not going on these trips to go sightseeing (neither are the kids – students, not sight-seers). We’re going to teach. We’re going because we think historic battlefields, ancient buildings, art museums, giant cathedrals, and restaurants serving odd foreign food are the best classrooms in the world. However, we don’t think the learning should begin the day we arrive in our destination country – that’s where we differ from a lot of high school groups – we start meeting with our students once a month almost a year and a half before we travel. A – Everything. We start by focusing on the basics, spending most of first year focusing on the basic history and geography of our destinations. The next year it gets much more narrowed down. Each meeting is broken into a few chunks. We spend some time on history – looking at the history of the towns and cities, and even the buildings we’ll see. On the culture side of things, we spend some time looking at literature, music, language, and art that ties in with our trip. We also spend some time focusing on the logistics of student travel – packing, behavior, getting through airports, hotels, bus trips, tour guides, foreign currency, and even using your cell phone overseas. We give the kids lots of opportunities to learn about what they want to learn before we leave – everything from reading books and watching movies to cooking foreign recipes and exploring art and architecture. It’s all about what’s most interesting to each kid. Q – Wait a second, did you you say “writing our books”? Do the kids actually write a book? A – Yes, they do. A few years ago the TAP teachers noticed that a lot of our student travelers were lugging around those expensive, heavy travel guide books. Most of them also had a composition notebook in their backpacks to journal each day about their adventures. On top of that, we even had a kid who’d printed up Wikipedia articles about every one of the places we were visiting, shoved them in a binder and lugged that thing around the whole trip.That was when the idea of a student created book was born. So, for the last several years, the TAP students write a book that combines the best ideas of a text book, a travel guide book, and a journal. The best part is that it’s almost entirely written by the students who are traveling with us. There’s a little help from the teachers, because we get so excited that we can’t help but contribute, and this year some of the parents, a few of our past travelers, and even a few younger kids that hope to travel with TAP in the future got into the game. Our book becomes an invaluable resource on our trip, as well as one of the coolest souvenirs ever. On top of that, this is a real published book (published by CreateSpace, a subsidiary of Amazon.com), so the students that contributed are going to have a pretty awesome line on their college applications in a few years. If you want, you can find our Spain, Japan, England, Central Europe, and South Africa books on Amazon just by searching for Minooka TAP. Q – How do they write a book? A – That’s easier than it sounds. At the beginning of the school year, our teachers will make a table of contents, which will basically be a list of all the important places (monuments, museums, theatres, churches, castles, forts, historical sites…), people (politicians, soldiers, artists, writers, musicians, historical figures…), things (pieces of art, books, poems, stories, food, and all sorts of stuff), and events (important pieces of history that happened in the places we’re visiting). We use that list to give the students some ideas. Each student is then asked to make a list of questions about what they want to know about that topic, research the answers, and turn that information into a short article. At each of our meetings, the teachers work with small groups to make sure those articles have accurate and complete information, steer the students towards what they need, assist them with their grammar and stuff, and just help them get the article ready for publication. Q – You just said, “grammar and stuff.” You’re a teacher, right? A – Yeah, “grammar and stuff” works for me. You got what I meant. Q – How do you ensure that everyone does their share? A – Everyone is assigned points for everything they help with. Having a rough draft of an article when it’s due is X number of points. Having a final draft is X points. Being at the meeting, helping with a fundraiser, participating in the book club, reading some of the articles we post on our website on the weeks we don’t have meetings… All of those are worth points. If you don’t have enough points – you don’t go on the trip. Q – Wait… if the kids don’t have enough points, they don’t get to go? A – Yes. It’s not hard to earn points. You just have to be at as many meetings as possible, help with our fundraisers, and make an effort to do the work we ask. It’s an academic/educational trip, and these kids want to go. This isn’t a boring, required class that no one wants to take. If these kids want to travel with TAP, then you’d think they’d be excited to be at the meetings and doing the work to help prepare them for the trip. If they don’t want to work, or aren’t showing us that effort, then that becomes a problem. If we have 29 kids on our tour who have researched, read, and written about the basics of our country, but have 1 kid that hasn’t – that kid will be lost when our guides and teachers are talking on tour. That 1 kid makes it so our guide has to revisit the basics, then everyone loses. That’s not how TAP works. We can not take a kid on tour that isn’t academically ready, because that takes away from what the rest of the group wants, deserves, earned, and worked very hard for. Q – Seriously? You seriously will kick a kid out of TAP if they don’t do the work? A – Yes. This isn’t school – this is different. There’s a lot on the line when you’re taking 30 kids overseas. Now, it hasn’t happened yet, but we came very close a few years ago. We got as far as meeting with one boy and his parents (who stood to lose a lot of money if he was kicked out). That boy stepped it up in the second half of the year and traveled with us in the end. On the last day of the trip he took a few of the teachers aside and thanked us for threatening him like that, saying “this trip wouldn’t have been nearly as awesome as it was if you guys hadn’t done that. It meant so much more, because I learned about so many of these places before we got here.” Two years later, he traveled with us a second time and became a leader, helping the younger students stay focused on their work. Q – Do you think maybe you guys should do TAP Movie of the Month? A – It’s funny that you say that. Just last year, we started the TAP Movie of the Month. Each month we’ve selected a movie for the group to watch whenever they have a couple of free hours. Then we open up a spot on our website to discuss the movie in terms of how it relates to the places we’ll be visiting. Q – Doesn’t all this seem like an awful lot of work? A – Yes and no. We think of it like the students have chosen to take an extra class. They have math, science, English, and social studies at school every day and TAP once a month. Yes, it will require them to manage their time and prioritize things sometimes. But, on the other hand, no, it’s not a lot of work, considering the pay off is a trip to the other side of the world that they’ll never forget. Please remember, our objective is never to overload them, simply to prepare them for the experience of a lifetime. A – Backtrack a second, you mentioned meetings on Saturdays. Why Saturdays? Q – Lots of reasons. The number one reason is that so many TAP kids are involved in after school sports and activities. We don’t want kids to have to choose between TAP and basketball or drama club or yearbook or cross country practice. In the past we met after school on Wednesdays, but each meeting would be half full due to all the other activities. Since moving to Saturdays, our attendance has been around 90%. On top of that, the kids seem much more focused on Saturday morning than they do on Wednesday afternoons after a long day of school. Q – Will we need a passport? Q – What happens if my little Susie loses her passport while on the tour? A – Who is Susie? We don’t have a Susie in our group. But, regardless of Susieness, we do our best to make sure that passports are kept safe. Each student will be assigned to one of the teacher chaperones. The teachers will keep the passports in their possession at all times. The only time Susie or her classmates will touch the passports is when we go through security and customs at the airport, and even then, the passports will be never be out of the teacher’s sight. Additionally, prior to departure, we will collect photocopies of each student’s important documents and keep those separate from the passports. If a passport is lost, the photocopy can be brought to an American embassy abroad and replacement of the ID is sped up. We’re pros though, so the lost passport thing has never come up, but if it ever does, we’re prepared. Q – What if me or my kid has special dietary needs? A – We’ll do what we can to make sure they are fed and work with our tour guides to find food that meets their needs. Pack them appropriate snacks just in case. Q – My kid is a picky eater. Will he be okay? A – He (or she) is going to have to get over that to some extent. Breakfasts are provided in our hotels each morning. European breakfasts usually include breads, cold cuts, cheeses, cereals, and juice. Sometimes we’ll see sausage, bacon, or eggs, but not too often. Japanese breakfasts were odd – we saw lots of rice, fish, and vegetables. Sometimes there was bread, fruit, eggs, or cereal. Once there was spaghetti. The dinners are predetermined. We’ll usually go to a restaurant, but the menu has been set in advance to accommodate our larger group and speed things up. 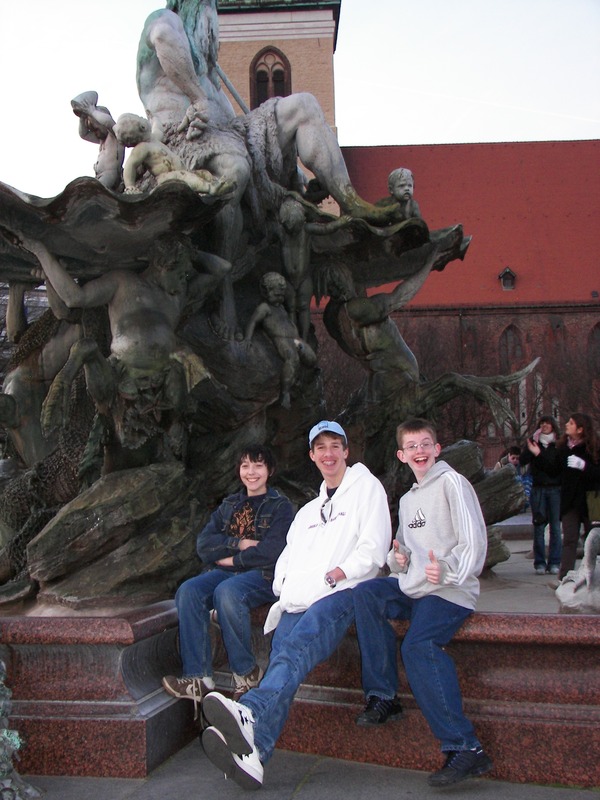 On our past trips, we’ve noticed that dinners are usually pretty kid friendly – the guides realize they are traveling with 14-15 year old American kids who have a certain palate. Lunches are on our own, so we eat what we find in that town. The tour guides are usually very good at pointing out good, cheap food in each city or town. We will not, will not, will not be eating at McDonald’s, KFC, Burger King, or Taco Bell – that’s not how you experience the culture of a foreign land. We will make every attempt to make sure your kid is eating enough. We highly recommend picky eaters (and everyone else) dedicate a section of their suitcase to a stash of healthy snacks (granola bars, trail mix, dried fruit, crackers, and the like). Q – What about medical needs? A – You should make the teachers aware of any major medical concerns your child is dealing with. We try to be prepared for any of those minor medical issues that come up like headaches, colds, sore throats, and the like. Send your kids with any prescription medicine they need and pack a little pharmacy for them with some Sudafed, Ibuprofen, cough drops, and that sort of stuff. In Italy we had a cold that made its way through the entire group, a handful of our Ireland kids wound up with a little stomach flu for about a day, and a few girls in Spain weren’t eating or drinking enough and started to get a bit dehydrated – but we survived, thrived, and no one looks back at their pictures and remembers the sniffles and tummy gurgles, just the amazing sights and activities.